As a tech geek living in the Pacific Northwest, I have a soft spot for two things: Cutting-edge gadgets and waist-deep powder. With that said, it should come as no surprise that I drooled like a rabid St. Bernard when I first laid eyes on Recon’s Mod Live HUD. They’ve been working on this technology for a few years now, and when the finished product was finally released this past Fall, I just had to get them on my face. With a tiny direct-to-eye display, Recon promises to deliver snowsport enthusiasts all the data they’ve ever dreamed of on the slopes: Distance, speed, weather conditions, and more. So, do the googles live up to their high-flying claims of realtime performance data? After diving into Recon’s snazzy packaging, we found the MOD Live HUD, a micro USB wall charger, a Bluetooth wristband controller, and a pair of Uvex G.GL9 goggles that Recon was kind enough to include for this review. Our demo unit came pre-fitted into the goggles, but we popped it out to get a better look. The HUD unit doesn’t appear to be much more than two bits of plastic connected by a wire, with a tiny screen protruding from one side. Don’t let it’s size fool you though – this thing packs a list of features long enough to make my comma button sore. We’ll get to those in a minute. Recon has been developing and refining this type of HUD tech for years now, and it shows. Its first product – the Transcend – was groundbreaking when it was released in 2010, and the company has further refined the design with the MOD Live HUD. It’s abundantly clear that Recon Instruments put a lot of thought into every aspect of the HUD’s design, and it’s made a lot of good decisions, but there are still a few things that could use improvement. We’re going to take a wild stab in the dark here and guess that the “MOD” in MOD Live HUD is short for modular. These badboys are designed to fit into a handful of different goggles from some of the top manufacturers in the game, and can also be purchased pre-integrated into certain goggles. Modularity is generally a good idea; if they can fit into goggles you already own, you can just buy the unit. However, since there are literally thousands of different goggles available from hundreds of different manufacturers, chances are that they won’t fit the goggles you have. Even though the HUD is modular, it’s not completely modular, so most consumers will need to buy a new pair of “Recon Ready” goggles just to use them. Regardless, we like where your head’s at, Recon. Another thing we like is the wireless wristband controller. 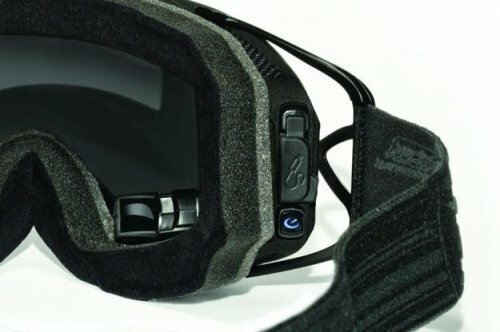 Recon’s first HUD goggle, the Transcend, had buttons mounted on the side of the goggle, which made them somewhat inconvenient to use. In the MOD live it seems Recon’s learned from the past. The wireless wristband controller is not only easier to access, but it also provides space for bigger buttons – buttons that are easier to press with a gloved finger. Still, we found the buttons to be a bit less responsive than we would’ve liked. Getting a click to register sometimes required hitting the button multiple times until you get it just right, but that’s a minor gripe. The software interface is where the MOD Live really shines. It’s essentially a specialized Android operating system with a slider that lets you cycle through different functions the same way you’d flip through pages on a smartphone. On each screen, you can access more functions by using the the center button and the directional pad. We had almost no trouble navigating the different menus and function screens. Anyone who’s ever operated a smartphone or iPod touch should feel right at home with the MOD Live OS. As far as durability goes, rest assured that they’ll hold up after even the harshest faceplants. 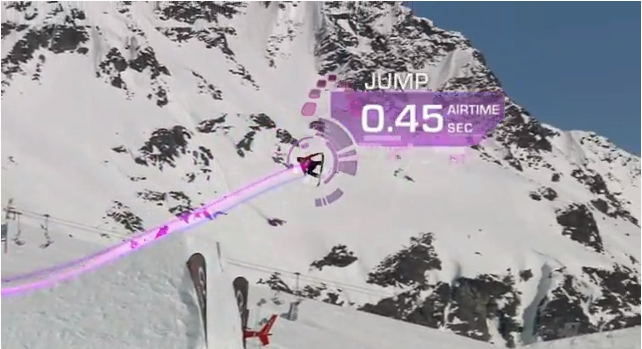 Recon knows snowsports are rough-and-tumble, so its HUD is as hardy as they come. We took our fair share of spills while testing them out, and impacts never affected the display – save for confusing the triaxial accelerometer for a moment. There’s no need to worry about moisture damage either. We got these puppies wetter than a baby seal on one particularly moist day up at Mt. Hood, and it seems that they can handle anything short of being submerged. The first thing we noticed when riding with the HUD was how dangerous it is to gawk at when you’re flying down the hill. Recon made a smart move when they positioned the HUD in a way that doesn’t obstruct the wearer’s vision. The only problem is, this makes it rather hard to look at sometimes. Okay, maybe “hard to look at” isn’t exactly the right way to describe it. Looking at it only requires a quick downward glance, a slight shift of the eye. It doesn’t even require any refocusing. Recon’s HUD is designed to appear like a 14-inch screen that’s five feet from your face. Now, despite all this trouble that went in to make it easy to see, the simple fact remains that this just doesn’t fit the standard definition of a heads-up display. A quick visit to Wikipedia shows that the agreed-upon definition of a head-up display is “any transparent display that presents data without requiring users to look away from their usual viewpoints.” With Recon’s HUD, you will be looking away from your usual viewpoints – albeit only for a few brief moments. It takes a while to get used to, but as long as you don’t gawk at the screen for too long, you won’t Sonny Bono yourself. This is easier said than done though, especially when there’s so many cool stuff to look at. Remember that laundry list of features we mentioned earlier? Well here it is: This thing’s got speed tracking, jump analytics, buddy tracking, elevation tracking, run tracking, GPS, live trail maps, music control, and smartphone connectivity. While these are all sure to please data heads, we found some of them to be more useful than others. Speed tracking: This is definitely one of the most fun features the HUD has to offer. It’s a bit on the jumpy side (especially if it’s stormy out and doesn’t have good GPS reception), but that doesn’t make it any less fun. When you’re not straight-lining down double blacks trying to break your speed record, you’ll find that filling in strangers on exactly how fast the lift is moving is a great conversation starter. Jump Analytics: By using a triaxial accelerometer and some creative programming, the HUD can discern between when you’re grounded and when you go airborne. It doesn’t register unless you’re aloft for more than a quarter of a second, but we were blown away by how accurate it was. We tested it on a range of different jumps and drop-offs, and even tossed it back and forth with friends as a control experiment. Distance readings weren’t always accurate, but the airtime and height measurements seemed to be spot on every time. The elevation and distance tracking data is interesting (and as far as we can tell, accurate) but not nearly as fun or engaging as the speed/jump analytics. Resort Maps: Despite taking several seconds to load, the live trail maps and GPS were surprisingly accurate. When I first fired them up, I was pleased to see such a detailed and responsive map of Mt. Hood Meadows. Now although they were really detailed – with color-coded lines detailing the location of each run and waypoints that would expand to reveal more information when our turned my head toward them – we’ve got to admit that we almost never looked at them again after that first test. The problem was that Meadows was just too familiar for that to be necessary. Instead, the maps really came in handy during a spur-of-the-moment trip up to Schweitzer – a resort I’d never been to before. When the kind lady at the ticket booth offered me a trail map, I declined with a noticeable confidence in my voice. She asked if I had been to Schweitzer before, and I told her, “no, but I’ve got some Terminator tech in my spectacles, so I’ll skip the paper this time, Sugar,” and shot her a wink. Okay, so that last part never happened, but that’s exactly how confident I felt. I rode around that beautiful Idaho resort all day like I had grown up there – never once needing to stop to find my bearings. Having a map in your face at all times is extremely helpful when you’re on an unfamiliar slope, which makes Recon’s HUD totally worth the steep price point if you’re the type who visits new resorts on a regular basis. However, for those who buy season passes and ride one resort all winter (most people), this feature will likely go unused. Battery life was nothing short of superb. Even when running the most power-hungry applications that require GPS and accelerometer data, a fully-charged MOD Live will probably last longer than your legs will on the slopes. Through all of our tests we determined it’ll run out after about eight hours, but that should be plenty of time for you to get some turns in. When reviewing any kind of outdoor tech, the big question is always, “Did it enhance my outdoor experience?” In this case, the answer is definitely a yes. While having fun on the slopes certainly doesn’t require fancy goggle tech, these HUD goggles do increase the fun factor in a big way. Not only was it enjoyable to check stats on the lift ride back to the top, but all that data had a noticeable effect on our riding. When you know your speed, you’ll inevitably find yourself trying to beat your personal best and set the high score. The same goes for airtime and height with the jump analytics feature – if you’re feeling competitive, you’ll always try to beat it. Additionally, the added freedom that the live trail maps provided was a definite fun booster. But alas, a more serious question remains: is it worth the hefty price tag? To that, we’re afraid the answer is no. Despite the fact that Recon’s HUD is extremely fun, the added bit of joy just isn’t worth $400. Skiers and snowboarders are a group of consumers who are already inundated with high equipment costs, and most will shudder at the thought of spending so much on an unnecessary piece of gear. Until the price drops a couple hundred dollars, these puppies will only be picked up by the most affluent riders and data-hungry pro’s in need of detailed performance metrics. Now although this tech might be out of reach for most consumers at the moment, anyone interested in this tech should definitely keep an eye on Recon in the future. HUD technology is progressing in leaps and bounds, and judging from improvements from the Transcend to the MOD Live, it’s a safe bet that Recon will continue to be a leader in sports-oriented HUD tech for years to come.